Acute Confusion: Abrupt onset of a cluster of global, transient changes and disturbances in attention, cognition, psychomotor activity, level of consciousness, or the sleep/wake cycle. 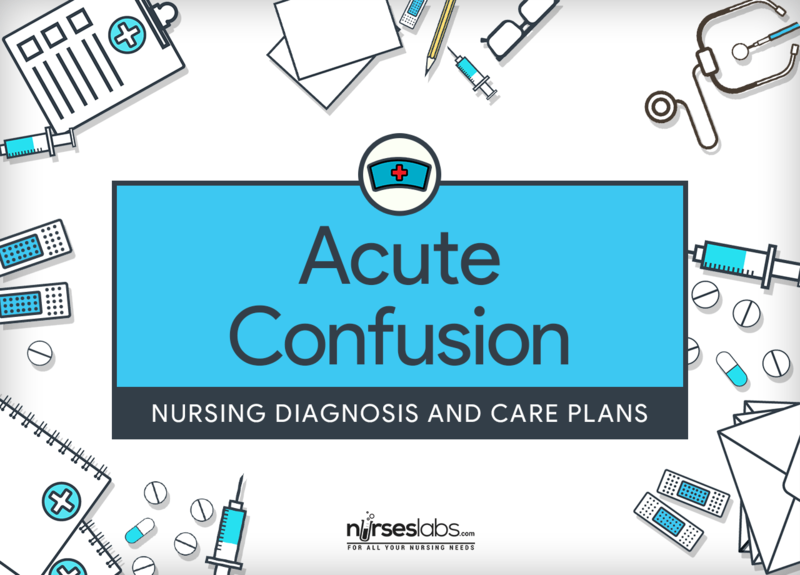 Confusion is a term nurses use often to represent a pattern of cognitive impairments. It is a behavior that indicates a disruption in cerebral metabolism. Acute confusion (delirium) can befall in any age group, which can evolve over a period of hours to days. Factors that increase the risk for delirium and confusional states can be categorized into those that increase baseline vulnerability including underlying brain disease such as dementia, stroke, or Parkinson’s disease and those that precipitate the disturbance like infection, sedatives, and immobility. The change is commonly caused by a medical condition, substance intoxication, or medication side effect. A person with dementia can experience acute confusion (delirium). Careful assessment is indicated to determine prehospital function and deliberate with family to perceive deterioration. Patient has diminished episodes of delirium. Patient regains normal reality orientation and level of consciousness. Patient verbalizes understanding of causative factors when known. Patient initiates lifestyle/behavior changes to prevent or minimize recurrence of the problem. Patient demonstrates appropriate motor behavior. Patient participates in activities of daily living (ADLs). Identify factors present, including substance abuse, seizure history, recent ECT therapy, episodes of fever/pain, presence of acute infection (especially urinary tract infection in elderly patient), exposure to toxic substances, traumatic events; change in environment, including unfamiliar noises, excessive visitors. Baseline information assists in developing a specific plan. Abnormal attention is a significant diagnostic characteristic of delirium. Delirium is a state of mind, while agitation is a behavioral manifestation. Some patients may be delirious without agitation and may actually have withdrawn behavior. This is a hypoactive form of delirium. Some patients have a mixed hypoactive/hyperactive type of delirium. Assess patient’s behavior and cognition systematically and continually throughout the day and night as appropriate. Delirium always involves acute change in mental status; therefore knowledge of the patient’s baseline mental status is key in assessing delirium. Evaluate and report possible physiological changes (e.g., sepsis, hypoglycemia, hypotension, infection, changes in temperature, fluid and electrolyte imbalances, medications with known cognitive and psychotropic side effects). Such changes may be contributing to confusion and must be corrected. Closely monitor lab results. Monitor laboratory values, noting hypoxemia, electrolyte imbalances, BUN/Cr, ammonia levels, serum glucose, signs of infection, and drug levels (including peak/trough as appropriate). Once acute confusion has been recognized, it is necessary to identify and treat the associated underlying causes. Review medication. Determine current medications/drug use—especially antianxiety agents, barbiturates, lithium, methyldopa, disulfiram, cocaine, alcohol, amphetamines, hallucinogens, opiates (associated with high risk of confusion)—and schedule of use as combinations increase risk of adverse reactions/interactions (e.g., cimetidine + antacid, digoxin + diuretics, antacid + propranolol). Medication is one of the most critical modifiable factors that can cause delirium, especially use of anticholinergics, antipsychotics, and hypnosedatives. Evaluate extent of impairment in orientation, attention span, ability to follow directions, send/receive communication, appropriateness of response. This should be done to determine degree of impairment. Note occurrence/timing of agitation, hallucinations, violent behaviors. Assess for sundown syndrome. This phenomenon associated with confusion occurs in the late afternoon. The patient exhibits increasing restlessness, agitation, and confusion. Sundowning may be a sign of sleep disorders, hunger, thirst, or unmet toileting needs. Aid with treatment of underlying problem (e.g., drug intoxication/ substance abuse, infectious process, hypoxemia, biochemical imbalances, nutritional deficits, pain management). Assisiting with treatment of underlying problem is important to maximize level of function and prevent further deterioration. Orient patient to surroundings, staff, necessary activities as needed. Present reality concisely and briefly. Avoid challenging illogical thinking—defensive reactions may result. Increased orientation ensures greater degree of safety for the patient. Modulate sensory exposure. Provide a calm environment; eliminate extraneous noise and stimuli. Increased levels of visual and auditory stimulation can be misinterpreted by the confused patient. Encourage family/SO(s) to participate in reorientation as well as providing ongoing input (e.g., current news and family happenings). The confused patient may not completely understand what is happening. Presence of family and significant others may enhance the patient’s level of comfort. Give simple directions. Allow sufficient time for patient to respond, to communicate, to make decisions. This communication method can reduce anxiety experienced in strange environment. Avoid challenging illogical thinking. Challenges to the patient’s thinking can be perceived as threatening and result in a defensive reaction. Provide for safety needs (e.g., supervision, siderails, seizure precautions, placing call bell within reach, positioning needed items within reach/clearing traffic paths, ambulating with devices). This is to prevent untoward incidents and to promote safety. Avoid/limit the use of restraints. This may worsen the situation and increase likelihood of untoward complications. Maintain normal fluid and electrolyte balance; establish/maintain normal nutrition, body temperature, oxygenation (if patients experience low oxygen saturation treat with supplemental oxygen), blood glucose levels, blood pressure. To treat underlying causes of delirium in collaboration with the health care team. Communicate patient’s status, cognition, and behavioral manifestations to all necessary providers. Recognize that patient’s fluctuating cognition and behavior is a hallmark for delirium and is not to be construed as patient preference for caregivers. Plan care that allows for appropriate sleep-wake cycle. Disturbance in normal sleep and activity patterns should be minimized as those patients with nocturnal exacerbations endure more complications from delirium. Tell patient to decrease caffeine intake. Decreasing caffeine intake helps to reduce agitation and restlessness. Manipulate the situation to make it as close to the patient as possible. Use a large clock and calendar. Encourage visits by family and friends. Place familiar objects in sight. An atmosphere that is close to the patient provides orienting clues, maintains an appropriate balance of sensory stimulation, and secures safety. Identify self by name at each contact; call the patient by his or her preferred name. Appropriate communication techniques for patients at risk for confusion. Offer reassurance to the patient and use therapeutic communication at frequent intervals. Patient reassurance and communication are nursing skills that promote trust and orientation and reduce anxiety. Identify, evaluate, and treat pain immediately. Unmanaged pain is a potential cause for delirium. Provide continuity of care when possible (e.g., provide the same caregivers, avoid room changes). Continuity of care helps decrease the disorienting effects of hospitalization. Maintain patient’s sleep-wake cycle as normal as possible (e.g., avoid letting the patient take daytime naps, avoid waking patients at night, give sedatives but not diuretics at bedtime, provide pain relief and backrubs). Acute confusion is accompanied by disruption of the sleep-wake cycle. Assist the family and significant others in developing coping strategies. The family needs to let the patient do all that he or she is able to do to maximize the patient’s level of functioning and quality of life. Teach family to recognize signs of early confusion and seek medical help. Early intervention prevents long-term complications.